Fourth of July 2017 – Independence Day with less trash, fun paddling and more art! Friends don’t let friends enjoy July 4th and trash Biscayne Bay! July 4th aftermath in 2016. Please help to do your part so we don’t have a repeat in 2017! Keep it light, stay cool and have a safe paddling holiday friends! Enjoy the fireworks and stars above! “Psychedelic gardens in the Sky” aka the July 4th fireworks! Attitude adjustment – Extra time out on Florida Bay! From the interior EVERGLADES to FLORIDA BAY and the KEYS, TEN THOUSAND ISLANDS, BIG CYPRESS & Beyond! but it’s always good to end on a hoppy note*! *Please drink responsibly! It’s OK to have a beer or two on the water, but it is against the law to be inebriated in your watercraft. Kayak While Intoxicated (KWI) ! © 2017 Flex Maslan / kayakfari.com / awakenthegrass.com /. All original photographs, artworks and music in this portfolio are copyrighted and owned by the artist, Flex Maslan, unless otherwise noted. Any reproduction, modification, publication, transmission, transfer, or exploitation of any of the content, for personal or commercial use, whether in whole or in part, without written permission from the artist is strictly prohibited. TBT Paddling to Squeeze in Ft Lauderdale – good to the last drop! Do not go to jail, go directly to Squeeze! Paddling past the jail on the New River in Ft Lauderdale to party! That’s the way I rolled! © 2016 Flex Maslan / kayakfari.com / digital029art.com. All original photographs, artworks and music in this portfolio are copyrighted and owned by the artist, Flex Maslan, unless otherwise noted. Any reproduction, modification, publication, transmission, transfer, or exploitation of any of the content, for personal or commercial use, whether in whole or in part, without written permission from the artist is strictly prohibited. Paddling into the Boca Bash 2016 – Boats, Bikinis & Beers! Satellite view of the route from Pioneer Park to Boca Lake for the Boca Bash 2016. You can take the scenic route around Deerfield Island Park or one of the shortcuts. 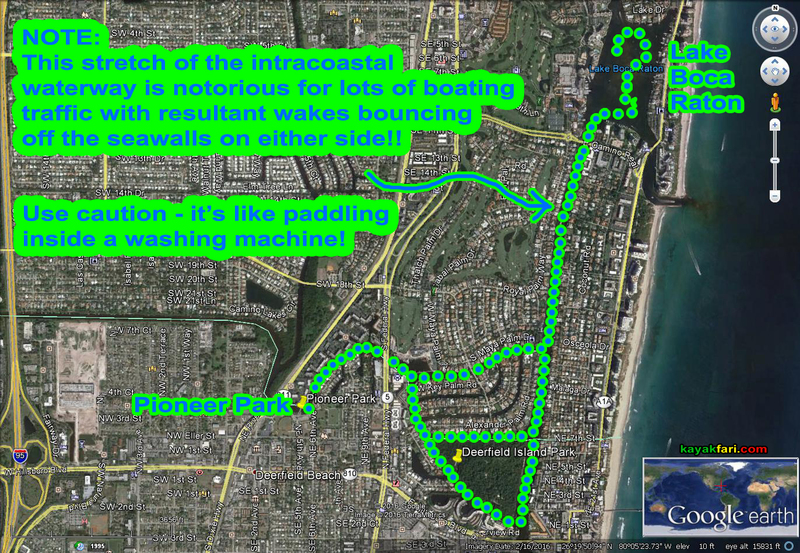 This was a last minute urban paddle through the intracoastal waterway into Lake Boca Raton. On the last Sunday of April, a giant raft up party is held there, called the Boca Bash. It appears to be an annual “tradition”, but I’m not sure how far back it goes. In any case, the event brought together several hundred boats, floats, kayaks, boards, SuPs, swimmers and revelers and a floating DJ booth pumping out some bangin beats! It was BIG, it could’ve been in the thousands! Paddling the Mojito up the intracoastal waterway to Lake Boca Raton. Thanks to my friend Stephen C, for waking me up in time to do this! If you don’t like or at least tolerate paddling among powerboat traffic, you can probably skip this. Like any big weekend event, parking was tight and access restricted, so we actually had to launch down at Pioneer Park at the boat ramps. This resulted in a short two mile paddle around Deerfield Island Park. About half of the route was through the intracoastal dodging multitudes of powerboaters of all types going in all directions! The wakes from all the heavy boat traffic created a lot of chop! This stretch of the intracoastal waterway is notorious for lots of boating traffic putting out big wakes that bounce off the seawalls on either side! At certain times it can feel like paddling inside a washing machine! Be realistic about your abilities and paddle accordingly within your limits. Knowing this ahead of time, I decided to take out the “Mojito“, an RTM Disco sit-on-top that loves rough water. The Mojito is my favorite surfing and play boat for South Florida! With the addition of thigh straps it responds just like a proper fitting sea kayak and can be rolled easily. It has a lot of rocker, turns on a dime and paddles nicely for a short 14 foot boat. I did have a blast surfing the various boat wakes and eddies created by all the wash! Stephen managing the boat action as we paddle by Boca mega mansions. Once inside Boca Lake we were greeted to the massive sight of people and boats of all types, everywhere. How this many people can pull this off in Boca Raton, Florida is still a mystery to me! Arrival at the Boca Lake sandbar raft up party – the Boca Bash! Lots, and lots and lots of peeeple! I was actually wearing my distinctive sun protective “face shield” a part of the time. Thing is that after a while I kinda forget that I have it on. “Don’t look at me with that thing! The center of the action by the DJ booth boat. Sound was actually pretty good, but could’ve been lil louder. Maybe next year they take it all the way up to 11 ? Pretty good vibe within the crowd! Paddling through this maze of people was kinda fun, people were having a good time. It’s interesting to note how the entire floating party was demographically stratified, just like real life. The most active section was the young crowd in the middle, on top of the sandbar by the DJ’s boat. Further out to the periphery were clusters of Latino and Southern folk and a more mature crowd towards the deeper north side. All this was actively patrolled by various LEOs doing their jobs! Kayafari on the Mojito at Boca Bash 2016! I like this color combination! Reds and blues under the sun. Sun getting lower in the sky, peeeple still having a great time at the Boca Bash. Paddling back down the intracoastal, this time I was passing a lot of the powerboaters as they chugged along in line. Like I expected, there was a LOT of activity at the Pioneer Park boat ramps. Boaters were again lined up, awaiting their turns. Here I had the advantage being in a kayak. I made a run straight for the ramp and pulled out of the water as quick as you can snap 1-2-3. Boat traffic lined up to use the Pioneer Park boat ramps. This is a good time to be a kayaker and make a beeline for the exit! Stephen had a lot of room in the back of his kayak and picked up a bunch of floating trash before leaving the party. Overall I thought that trash was reasonably well managed on this raft-up. There was some, like there always is (sadly), but nothing like the infamous Floatopia Miami trash disaster. Still, we saw that the facilities at Pioneer Park were overrun. Maybe they didn’t have or plan for enough trash cans and containers? Hopefully all that overflow was picked up promptly come Monday AM! In the aftermath of the event, the media report that a fight broke out at one point, and that five people were arrested for various minor offenses. That’s not too far out of the ordinary where a lot of people gather in one place and drink a lot. I’d call this raft-up a success! Trash overflow at the end of the day at the busy Pioneer Park boat ramps. Let’s hope all this got picked up the next morning! All in all, we both agreed that this trip had been worth the effort. Most def NOT a typical kayak trip! Three’s company – a winter birthday triad on Florida Bay! A Florida Bay birthday triad cruise on the ‘Banana Boat’ with special guest ‘Hubble Jr.’ and a planetary alignment! This one is all about threes. That’s the theme!